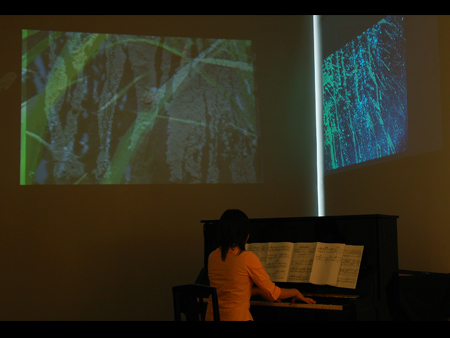 It is the installation which made movie, pictures and music interactive synthetically. Material is mud. By the mud of a rice field that the starting point of a life, some complicated images appear and disappear. The movies are sorted into two kinds. One is what recorded scene of throwing the mud at the board and signs that it gets dry. 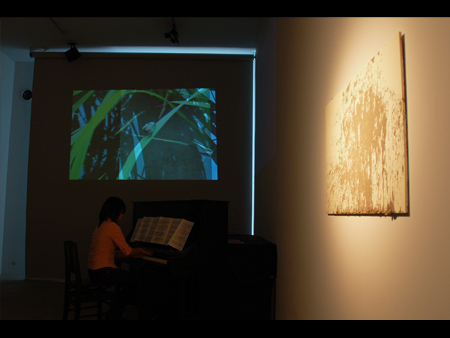 The other is which recorded landscape of a rice field(the leaf of rice, worms,etc) when collect the mud. I take the dynamic motion by mud and textures. The appreciation person can operate the movies by playing the piano (playing music). The sound of the piano which an appreciation person plays take by microphones, and it processes in real time, and the movies are projected.（Programming by max/msp,jitter）The pitch of sound fix to which movie is played and the horizontal position (high sound is right, low sound is left) of each movie. The loudness of sound fix the visibility (small sound is low) of the movie. When more than one key is pushed at the same time, some movies assigned to each key are played, and these are layered and compounded. 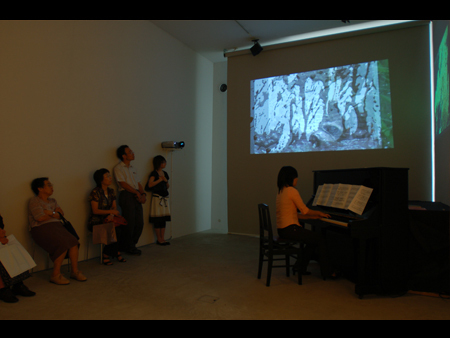 The amount of cross fade (the amount of composition) at that time is dependent on the strength of a touch of each key. 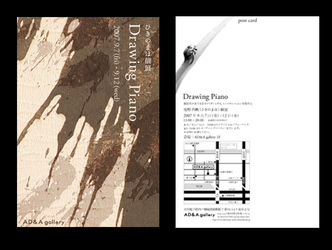 Moreover, pianist gives performance.The playing program is" Rain Tree Sketch: Takemitsu Toru ","Brouillards/ Pr&eacuteludes 2: Claude Achille,Debussy". 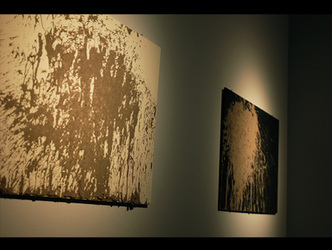 The pictures drawn with the mud used for movies are also exhibited. It finished a pictures independent as a work.By using the mud of the rice field as pictures, the ingredients of mud (sand granules, clay, the mineral that shines glitteringly, rice husks and straws, microbes, water plants) original with the land appears. It's rich expression. "sound and water are alike, for me. By motion of man's　feelings, it feels water that is inorganic matter like a organic thing just as if it ware a life form. Moreover, our mind tries to find out beauty, mystery and various feeling in the sound which is only a physical wavelength (mystical coincidence of words). We know this water only in a temporal existence. They are temporarily called rain, a lake, a river, and the sea. Music is also like a river or the sea. As is many character differs surges make waves in ocean, music deepens the life of us and give the life a new aspect,always.